Train your mind to negate all the excuses that might otherwise keep you from getting the body you want. We are ALL busy and everyone has the same number of hours in the day. Some people make time to exercise - others don’t. 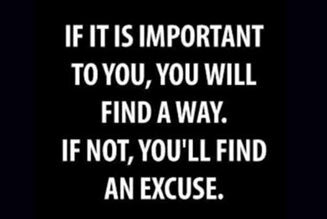 It’s all about priorities and deciding what matters to you. If you start seeing exercise and good health as a priority then you’ll make the time for it, even if it means waking up earlier each morning, exercising at the weekend or saying no to social outings. Once you’re willing to put in the hard work it takes to get your dream body, everything else will fall into place. We all have different genes and some of us might have to work harder than others to get the body we want, but this will create a level of inner strength and determination that others don’t have. Having poor genes is not an excuse to remain overweight or to follow a poor diet. Get going and make the most of what Mother Nature has given you. A popular bodybuilder once said: “the harder I train and the stricter I diet, the better my genes appear.” Make the mostout of yourself or click here to learn more about your genetic body type . Next time you catch yourself thinking that, tell yourself: “I am willing to endure the temporary pain of exercise in order to gain a lifetime of physical and mental strength.” If you incorporate it into your daily routine and establish it as a habit, the chances are you’ll hate skipping a workout instead. Once you start building physical strength, you'll start enjoying it. If you commit and start improving your body, you won't hate exercise. You'll start feeling addicted and will NEED it! Once you start exercising, your strength and energy will start to increase week by week. If you want to have MORE energy in your life, you SHOULD start exercising. Just remind yourself of how good you’ll feel when your workout is over.Exercise will improve your life and give you more energy to be more active and achieve even more goals. Do you really want to miss out on achieving the body of your dreams? If you put in some hard work and make a commitment for at least a couple of months, your body will completely transform, and you can be half the size you are today. You’ll also see new changes in your body on a WEEKLY basis. Aspire to become a role model to others and be the best version of yourself that you can be. Learn about the benefits of a healthy lifestyle and you might just change your mind! Many bodybuilders and fitness models cook just once a week in bulk, preparing their meals for the week ahead in advance. This means you only need to dedicate one afternoon per week to cooking healthy meals, then freeze them. Even if you choose to order in, you can always choose grilled chicken breast instead of burgers or a pizza. Take it from someone who lived on junk food that you CAN transform and learn to like healthy food. It only takes three weeks to establish new habits, so follow your plan for the first few weeks and it’ll quickly become simple and routine. Healthy food makes you feel good, happy and active. Junk food makes you feel lethargic, overweight and lazy. Finally, remember that healthy food is the fuel your body is really craving. Everyone who goes to the gym does it to exercise, and nobody judges others. On the contrary, people ADMIRE those who have the commitment to go to the gym. If anyone judges you for the way you look, it says more about THEM and their insecurities than it ever will about you. Besides, the sooner you hit the gym, the sooner you’ll be saying “I look awesome!” instead of “I look awful.” People who judge others nearly ALWAYS have a problem with themselves. Remember this old saying: "A lion does not lose sleep over the opinion of sheep." It’s easy to find ways to exercise for free, whether it’s jogging outdoors, performing jail workouts at home (exercising using your body weight) or buying home workout DVDs. These options are cheaper than all the gimmick supplements, machines and pills that claim to make you thin, and they’ll make you look better too. You can always follow the workout programs posted on the weight training page and will not even need to use a personal trainer! There are plenty of exercises you can perform that won’t put undue strain on your injured muscles or joints. On the contrary, lifting weights increases muscle strength, which protects your joints from injury. Swimming is also a great form of exercise that doesn’t put any pressure on injured muscles or joints. Learn more about common sports injuries here.